Kettle Falls Photo Gallery: Woman fishing with a pole and line at Kettle Falls. Woman fishing with a pole and line at Kettle Falls. 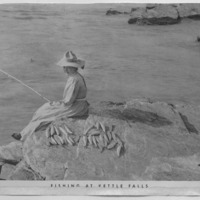 “Kettle Falls Photo Gallery: Woman fishing with a pole and line at Kettle Falls.,” Crossroads Archive, accessed April 19, 2019, http://crossroadsarchive.net/items/show/25567.